﻿ How to Create Great Characters! Strangely enough, what makes a character “Great” has little to do with what makes a character dramatically sound. This is easy enough to see if you consider the differences between the characters Austin Powers and James Bond. Both could be seen as Protagonists, and both could even be seen as heroes, and yet their personalities, mannerisms, interests, and attitudes are quite dissimilar. What makes them the same is their dramatic function; what makes them different are their personalities. 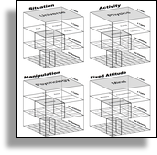 Dramatic function is part of a story’s logistic structure. Without a function, a character is little more than window dressing. Yet, even the most strongly drawn structural character is quite forgettable without a charismatic personality. Stucturalist writers tend to start with the function (Antagonist, Protagonist, etc.) then build a personality on that foundation. Intuitive writers usually want to get to know their characters first as individuals, then determine what function they should play in the structure. No matter which kind of writer you are, you will eventually need to develop your characters’ personalities. So, here’s a great trick to brainstorm your characters and perhaps even learn something about your plot along the way. More than likely, you remember a childhood toy that was a book with pictures of faces, each cut into three pieces: top, middle, and bottom. The top section of each face had the hair, the middle section covered the eyes and nose, and the bottom section displayed the mouth. By flipping parts of each page, you could create all kinds of different people, swapping the hair of one with the eyes of another and the mouth of a third. We can apply a similar concept to character attributes and physical traits to create dynamic personalities. Now think about how these characters changed their personalities, just by swapping a single attribute from one to the other. A Male Mercenary, age 38 simply has a different “feel” than a Female Mercenary, age 38. Why? Due to our cultural indoctrination., we expect certain things of men and certain things of women. We therefore expect a Male Mercenary to have a different personality than a Female Mercenary. In other words, it would require a different personality of woman than a man to become a Mercenary in our society. So, we (as creative authors) tend to subconsciously assign those personality traits to the character, even though we have really only spelled out the character’s role and gender. Again, we impose our own subconscious expectations of each character’s personality upon him or her so that we have a completely different feel for each than we did before. Once again, the personalities change. We might find that one of these characters strikes our fancy as being interesting to develop and put into play. But more than likely, we haven’t found the “Great” character we are looking for. What we need are more traits and attributes, and more characters to swap them among. What I usually do is list various traits and attributes on 3x5 cards, cut them up into individual items and then assemble them like the Face Book to create potential characters for my story. Well, I could go on an on with this list, but you get the idea. The best way to compile a list of categories like this is to read the newspaper, watch television, or sit in a coffee shop and look out the window. Now, in each category, you need to come up with as many different items as you can. For example, in the first category, Name, we might have the usual Joe, and Sally, but also Zippo, Teaser, Tweezer, and Mulch. The weirder, the better. Let’s take our Female, 9 year old Mercenary and name her Sally. Now how does her personality change if we name her Tweezer, or Mulch instead? In tangible reality, there is no indicated difference between Sally, the 9 year old Female Mercenary and Tweezer, the 9 year old Female Mercenary. And yet, we cannot help but feel they are different because of our cultural indoctrination. As a brainstorming technique for creating “Great” characters, the mix and match method is the best way I’ve found to break away from the same old forgettable stereotypes. Now most of this you’ll need to do this manually, but in fact there is a place in the Dramatica Pro software that can help take some of the drudgery out of it. From the main Dramatica Desktop, click on the Brainstorming tile. Then, select the Character Generator Tile. Here you can automatically generate characters by arbitrarily assigning them names, genders, and structural functions as archetypes or complex characters. And speaking of structural functions, have you noticed that none of the attributes we assigned to our characters above gave any indication as to their status as a Protagonist, Antagonist, other archetype or complex functional character? If you are a structuralist writer, you’ll first start with your Protagonist (or whatever structural function you wish to begin with) and THEN play the mix and match game on that foundation. If you are an intuitive writer, you’ll start with mix and match and then pick one character and determine what function he, she, or it should play. Take Tweezer, our nine-year-old Mercenary. Would she be a better Protagonist or Antagonist? When you pick a structural function, it ties the character to the plot and further defines the foundation of its personality. And, because you have likely chosen a role for your character, such as Mercenary, the combination of roles among your characters can actually start to suggest the outlines of a plot!